There is a statue of limitations on a judicial review is usually three months since enactment of a new law, however this can be waived when there is a significant public interest. The court chose not to waive this barrier. The court agreed with the DfE that ABC could challenge this through the Information Commissioner’s Office (ICO) rather than through court. ABC’s argument was that this change was brought through an act of parliament and so can only be challenged through a judicial review. ABC will now look at the ICO route. Our legal challenge will be taken to the Court of Appeal but this may take up to a year before being heard. So our legal route has been paused until we hear back from the Court of Appeal. Campaigners have argued that the collection of nationality and country of birth data fulfils no identifiable educational purpose, especially given the separate collection of data covering the numbers of pupils for whom English is not their first language. This indiscriminate data gathering exercise violates the rights of children and their families to a private life, ABC and others believe. “This is a significant setback for efforts to legally challenge this aspect of the Home Office’s unfair and unjustified ‘hostile environment’ agenda, first established when Theresa May was Home Secretary. We believe there is a strong public interest case and that this point of law should be challenged in court, which why we will take this to the Court of Appeal. Other cases will continue, though, such as the Migrants’ Rights Network challenge to the sharing of patient data between NHS Digital and the Home Office. We will continue to back all efforts like this to overturn cruel and divisive policies of this sort. “We are also not done with the Department for Education, despite this disappointing news. We will prepare a challenge through the Information Commissioner’s Office. We will continue to work towards our goal to ensure every school puts the education and safety of all children ahead of this perverse ideology. Every child has has the right to education, free from discrimination and fear. Access to free education is a fundamental right to every child in the UK. Against Borders for Children (ABC) believes that all children should feel safe and secure at school, our Education system should ensure that no child is systematically marked as “different” or unwelcome. Our convictions led us to start this campaign and launch a legal challenge against the Department for Education’s (DfE) decision to collect nationality and country of birth data for all children in state funded education in England since 2016. We have heard the stories of division, ethnic ascribing and passport checks that have taken place since this policy was introduced in September 2016. Parents, schools, unions and many sections of civil society have joined us to urge the government to reconsider. We now know that in January 2017 the Department for Education failed to obtain nationality data for a quarter of all pupils in England – around 2 million children! Through our campaigning we have prevented nationality data from being shared for immigration purposes, but that concession could be changed at any time. This is why the legal challenge is of strategic importance to the campaign. On January 2nd, our solicitors at Liberty formally put our High Court case to the Department for Education. We now await DfE’s response before court hearings start later this year. We will keep you posted on progress and expected key dates. ABC would not have been able to submit such a strong case without the incredible support we’ve received from communities, associations and individuals across the UK. So once again thanks to everyone who shared and donated our crowdfunder – in impressive timing we hit our target of £12,000 which we believe will cover our legal liabilities for our High Court case this year. Please remember to keep sharing #BoycottSchoolCensus to inform parents, carers, and guardians that they have the legal right to stop DfE from collecting their child’s nationality status and country of birth. The next census day is Thursday 18th January and more details on how to refuse, retract and resist here. Thursday 18th January 2018, is Spring School Census day. Every primary and secondary school or academy will be updating pupils records noting the country of birth and nationality details of every child that attends their school. This sensitive personal data is being collected on all 5 to 19 year olds and then sent to the Department for Education. Though DfE maintains that this will not be shared with the Home Office, and while we believe that is the case, the original plan was to, and the DfE could decide to do so in the future. So until this data collection is scrapped, we are urging every parent of any school aged child to boycott this census by sending their school this form with their name, signature and their children’s names. If any parent/guardian/carer has previously given this information to their school, they can get this data deleted using their right to retract – simply respond “refused” in this census using this form. This Thursday may be the last opportunity to get that data removed, as the Government planned to review this right in December, although no further announcement about this has yet been made. We believe all children have a right to education and schools should be places of safety which welcome all children. So Against Borders for Children are now taking the Department for Education to court to scrap this policy, we believe our case will continue until the middle of this year. 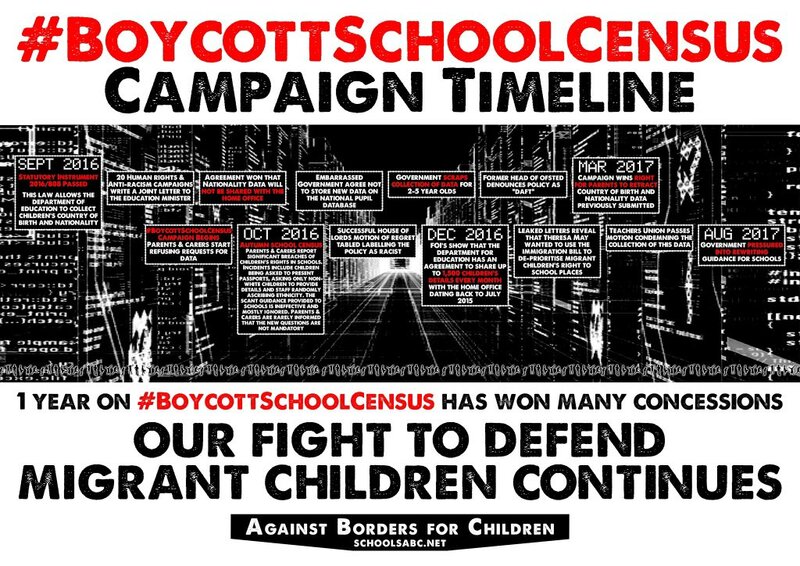 So please continue to #BoycottSchoolCensus refuse, retract and resist this government’s attempt to build a migrant child database. Today Against Borders for Children (ABC) is celebrating the success of its crowdfunding appeal, which will support a judicial review of UK Government’s policy of requesting country of birth and nationality information on children in English schools. On the 7th of December, less than two weeks ago, ABC launched a public appeal for £3,500 towards the costs of this action, with a stretch target of £12,000. This latter target was reached last night during the last 12 hours of the appeal, which was hosted on CrowdJustice, a public interest crowdfunding platform. The case against the Secretary of State for Education will be heard at the High Court in London, and ABC will be represented by human rights NGO Liberty and Garden Court Chambers. This policy of data collection, part of the Prime Minister’s “hostile environment” agenda towards migrants, has been opposed by ABC, Privacy International, the Refugee Council, the Latin American Women’s Rights Service and 20 more organisations, and even the House of Lords. The National Union of Teachers also urged all parents to withhold this data. The collection of this information in respect of every child, critics including ABC have argued, may violate the rights of children and their families to a private life under Article 8 of the Human Rights Act. Equally, no evidence has been presented by the government to suggest that the collection of this data fulfills any identifiable educational purpose, given first language data is already separately collected. Information obtained under Freedom of Information legislation in 2016 showed previously collected pupils’ data had been passed to the Home Office for immigration enforcement purposes on several occasions. The plan was for nationality data to be also passed to the Home Office until our campaign forced a stop to it. “More than five hundred members of the public have chipped in to support this case, and it’s fair to say we’ve been blown away by the scale of the response. It’s an excellent sign that the Prime Minister’s attempts to make this country into a more hostile environment has plenty of opposition out there, and we will now do our best to win this case and overturn this vile and discriminatory policy. I’m writing to your branch as a primary school teacher and a campaigner with Against Borders for Children (Schools ABC) to ask that you help to fund our legal challenge against the Department for Education. Schools ABC is a group of teachers, parents and civil liberties campaigners who began working together in autumn 2016 following the government’s decision to add country of birth and nationality questions to the termly school census. This data collection demonstrably serves no educational purpose and contributes to a climate of xenophobia and racism in our schools. Successful litigation against the DfE could mean that these divisive and unnecessary bureaucratic requirements are scrapped for good. The government had always planned to share collected data with the Home Office. Leaked government letters revealed that the pupil nationality data collection was a compromise reached between the then Education Secretary, Nicky Morgan and Theresa May, who had originally intended that the children of undocumented migrants be ‘deprioritised’ for school places. A secretive data-sharing agreement was made in 2015 between the Home Office and the DfE that allowed information pertaining to 1,500 pupils to be shared with the Home Office every month. With support, we’ve won a number of partial victories, but the legal framework allowing the data collection to occur is still in place. Parents’ right to retract their children’s data is being reviewed in December 2017. We believe the Government plans to scrap the right to retract data. We intend to continue campaigning until the policy is withdrawn altogether, and a legal challenge to the Department for Education has the potential to achieve this. If you have any questions or would like to meet to discuss, please do not hesitate to contact us. On Monday 20th November, Universal Children’s Day, Against Borders for Children (ABC) launched a crowdfund to raise a legal challenge against the Department for Education (DfE) on the legality of gathering nationality and country of birth data on children in England. You can pledge your support for the crowdfunding campaign on Crowd Justice, a public interest crowdfunding platform. The nationality data, gathered on children as young as six through the School Census since October 2016, is not being collected for any educational purpose. The DfE originally planned to hand over pupils’ nationality data to the Home Office as part of the Prime Minister’s migrant focused “hostile environment” agenda until public outcry led by our campaign prevented it from doing so. This UK Government policy has been condemned by the House of Lords, and by numerous organisations, including the National Union of Teachers, Privacy International, the Refugee Council, and the human rights organisation Liberty which represents ABC in this legal challenge. “If you care about the rights of children to be educated in an environment free of the threat of deportation, in line with the UN Convention on the Rights of the Child, join us. “All too often people feel powerless when faced with this kind of racist policy-making, and the atmosphere of division and fear it generates, but the truth is we can fight it. Theresa May’s legacy at the Home Office includes making schools ask only those children assumed to be migrants to bring in passports and birth certificates – it’s utterly unacceptable. A year ago today, Statutory Instrument 2016/808 slipped quietly into force. It looks innocuous enough, but it’s the law that allows the Department for Education (DfE) to collect children’s nationality and country of birth through the school census. When the Against Borders for Children (ABC) campaign launched a couple of weeks later, we knew that the National Pupil Database (NPD) was insecure and opaque. Identifiable information on children aged 5 – 19 is collected by schools and held there forever. Nobody has the right to ask what information the database holds on them, or whether it is accurate. And the DfE hands identifiable data out to third parties including journalists and private companies. What we also knew in September is that the Home Office and the police had accessed the NPD too. Against the backdrop of a referendum vote that had thrown the rights of millions of people living here under EU law into jeopardy, and Theresa May’s mission to create a “hostile environment” for migrants, we didn’t trust the government with children’s nationality data. And especially not when as recently as 2015, it had been trying to scaremonger the idea of “education tourism” into being. What’s more, in 2013 coalition ministers had contemplated a truly diabolical policy: excluding the children of undocumented migrants from school entirely. We thought we’d give the government the opportunity to do the right thing first of all. Along with almost 20 other human rights and anti-racism groups including Migrants’ Rights Network, JCWI and Liberty, we wrote to Education Minister Justine Greening and asked her to protect migrant children in schools and scrap the data collection. But of course, that was to assume that the government had a conscience. As expected, it pressed on with its plans, and #BoycottSchoolCensus began in earnest. With only woefully poor guidance from the DfE to follow, schools made huge mistakes in collecting the data. Some constituted significant breaches of children’s privacy rights, and others were downright racist. National papers reported schools asking only non-white pupils for their nationality. Some schools wrongly asked children to show their passports. Across the board, schools failed to inform parents that they have a right to refuse to hand over their child’s nationality or country of birth data. But we knew that if every parent exercised that right to refuse, it would make the dataset unusable to the government, and tell them what all of us already know: migrant children and families are integral parts of our communities, and border controls have no place in our classrooms. What we’ve found out over the short lifetime of the campaign is truly chilling. While we were initially concerned that new nationality data would be shared with the Home Office, it turns out that the DfE has actually been operating a secret deportation machine using children’s school records since 2015. The agreement, released through FOI in December, shows that children’s names, addresses and other personal details are harvested from the NPD and routinely handed over to the Home Office by the DfE at a rate of up to 1500 children a month. The agreement doesn’t just target undocumented children, but any child that has an undocumented family member that might be traced through their school records. What’s more, the FOI release shows that the government had always intended to hand over nationality data to the Home Office once it was collected. It only removed nationality from the data-sharing agreement in response to public pressure. And December brought us another nasty shock: leaked letters revealed that in 2015, Theresa May had wanted to use the Immigration Bill to require schools to check children’s immigration status, and push the children of undocumented migrants to the back of the queue for school places. She only withdrew these measures when Nicky Morgan, then Education Secretary, agreed to collect nationality and country of birth data as a compromise. The DfE’s protests that nationality data is being collected for the benefit of migrant children turned out to be a barefaced lie. While exposure of the government’s nefarious agenda has left us with serious concerns about where this country is headed, with the support of parents and teachers, the campaign has won successes that fill us with hope. We pulled off a successful motion in the House of Lords regretting that children’s nationality data is being collected. “Children are children”, said Lord Storey, “and to use their personal information for immigration enforcement is disingenuous, irresponsible, and not the hallmark of a tolerant, open and caring society”. Almost every opposition party, the National Union of Teachers (now part of National Education Union), and even the former head of Ofsted have denounced the policy. We embarrassed the government into keeping nationality data out of the leaky NPD. We won parents the right to retract nationality data that was collected under false pretences. We forced a change in the data-sharing agreement between the Home Office and the DfE to ensure that nationality data is not shared for immigration enforcement purposes. We pressured the DfE into rewriting its guidance to schools for the 2017-18 year, emphasising parents’ rights to refuse and retract nationality data. And the day after we met with DfE officials in November, they announced a massive climbdown – that ill-judged attempts to collect nationality data from 2-5 year olds would not go ahead. The government can’t be honest about how its brutal austerity measures have crippled our public services, so it’s blaming migrants instead. As border controls mushroom, dragging doctors, teachers and social workers into the dirty work of immigration enforcement, campaigns of non-compliance are key to protecting migrants from the racist vilification that they increasingly face. And schools are a cornerstone of that non-compliance. Even if the government isn’t sharing children’s nationality data now, it could rescind that promise at any moment. It could also use the data as a basis for a future policy that restricts migrant children’s access to school – all the evidence shows that it has been trying to do this for years. And the agreement to share other parts of children’s school records, including home addresses, continues to deliver immigration enforcement officers to the front doors of unsuspecting children and families. Respond ‘refused’ to any request for your child’s nationality or country of birth. This is your right and there is no sanction for doing so. You can use our template letter to do this. If you gave data in previous censuses, retract it by answering ‘refused’ to nationality or country of birth in this census. This will overwrite any data you gave in the past.Encourage other parents to do the same whatever their immigration status – the more parents that refuse to give nationality data, the better protected migrant children will be. Contact us to tell us why you oppose this policy, and we will support you to turn your concerns into action. Record ‘not yet obtained’ as the default nationality and country of birth for all children in your class. Let parents know that they can opt in to giving their child’s nationality or country of birth data, but only if they want to. Talk to your headteacher and local union branch about how you can use your collective power to oppose the encroachment of border controls into your school. The ABC campaign is run by a handful of people, most of whom do other full-time work, and we need all hands on deck to keep going! Wherever in the country you are based, if you have time or skills that you could put to good use with us, contact outreach@schoolsabc.net and we’d be glad to have you join us. Having been supported thus far by migrant youth groups Jawaab, Sin Fronteras and Let Us Learn, we’re particularly keen to hear from young migrants on what our priorities should be for the coming year. and we’d love to see some of you in person there too.